Is Your Computer Acting Up Or Sluggish? Let Rhyme inspect your PC or laptop and get to the root of the problem with a FREE inspection. The free inspection includes up to 30 minutes of diagnostics and qualifies customers for a discounted labor rate. *Free inspection conditions – carry-in only, applies to Windows operating systems, limit one (1) per customer and discounted labor charge applies to the first hour of labor. Rhyme is a local computer repair service center serving the greater Madison Wisconsin area. 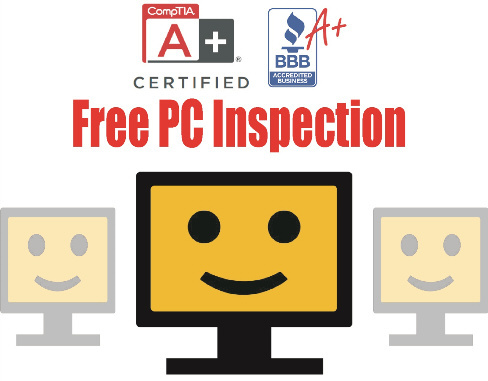 Let an A+ certified technician resolve your computer related issues. Diagnosis – Rhyme can identify potential problems and provide you with a comprehensive estimate for a nominal fee. Virus and Spyware Removal – Is your computer sluggish or just plain unusable? Rhyme can help you get rid of malware including viruses, worms, trojan horses, ransomware, spyware, adware, scareware, and other malicious programs. Hardware Installation & Repairs – Computer issues are sometimes caused by defective hardware. Your network card, video card, memory, soundcard or many other peripherals may be causing you unwanted grief. Let Rhyme diagnose the one of many possible hardware problems you can encounter. Full Operating System Installs – Sometimes its best just to start fresh with an operating system reinstallation. Rhyme can help you restore your computer to factory specifications and reinstall any applications you need. Want to upgrade to a new operating system from an older version? We can help with that too. Setup – Do you have a new computer, but don’t know what to do? Let us help you set up user accounts remove trial versions of software and help you customize your PC to fit your needs. We can help you install free-ware software and tools to help you keep your computer clean and secure. Optimization – Is unnecessary software (also called “bloatware”) bogging your system down and decreasing the performance of your computer? Let Rhyme help you optimize your computer by removing unwanted software and limiting the startup programming robbing you of its potential. Upgrades – Do you need more memory, or a video card upgrade? We can do that too! An upgrade can be a very feasible, and economical solution to speed up your computer and bring it up to date without having to buy a brand new computer. Backup – Do you have files on your computer that you can't afford to lose? Then consider backing up your hard drive so you can restore it to its former glory and preserve your valuable files in the event of a hard drive failure. We can help you with local and online backup options.